Repeat Step 1 three more times to create a total of four turtles. 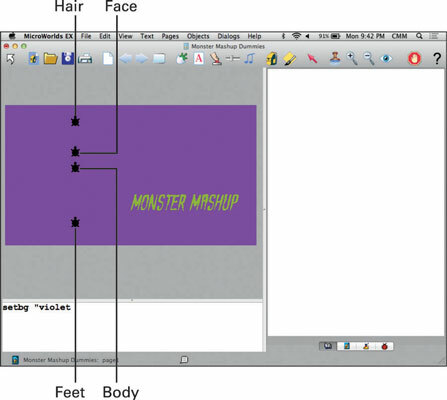 Drag each turtle on the workspace to create a vertical lineup similar to the example. The turtle near the top of the workspace will be the monster head. Right-click (Windows) or Ctrl-click (Mac) on the top turtle and select Open Backpack from the pop-up menu. On the State tab of the turtle backpack, click the Edit button. The turtle Name dialog box opens. 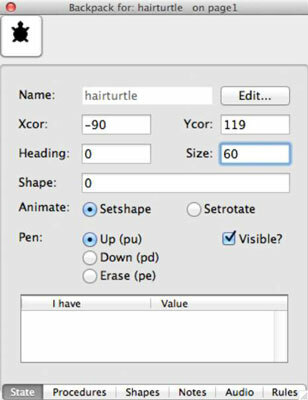 In the Name text box, type hairturtle for the turtle name and then click OK.
On the State tab, enter 60 in the Size field. Note that other attributes on the State tab, such as your Xcor and Ycor, will probably differ from the example. Note that you may need to make additional size adjustments later to make all the body parts fit together. As your computer programs become more complex, it’s a good idea to name all the turtles, shapes, and other elements. This helps you keep better track of everything in your code. Naming a turtle something like feetturtle — not just feet — lets you know that the element is a turtle when examining your code.